Donut Taco, the newest restaurant within a five-mile radius from campus, opened about two months ago. It’s conveniently located at 2209 SW 104 St. next to Qdoba, which seems like a mistake. Let me assure you, it was. Donut Taco sells tacos and doughnuts, not some glorious combination of the two, so before you get your hopes up, don’t expect much. I went to Donut Taco for lunch, the prime time to consume a taco or a doughnut, but the place was empty. I thought this might be a red flag, that maybe everyone was too caught up in Qdoba to realize the hidden gem 50 feet away. After browsing the relatively simple menu while smelling the scent of fresh doughnuts, I decided to order the Taco Lunch Special. This included two tacos with the option of chicken, steak or pulled pork, and two sides with the options of rice, beans, guacamole or sour cream and a fountain drink for $7.49. I chose the chicken tacos with guac and sour cream. At first, I was a little confused because sour cream and guacamole are not sides at most Mexican restaurants — they’re toppings. Much to my dismay, I didn’t even get chips with this so-called “lunch special,” but I was determined to make the best of my expensive lunch from a donut shop. That is, until I tasted the tacos. I was excited at first, because they actually looked halfway decent, but once I took a bite, I knew why all the smart people went to Qdoba. The chicken wasn’t flavorful and left a bad aftertaste. All of the other toppings like the tomatoes, onions and cheese were decent, but didn’t taste very fresh. However, they were much better than the chicken. I ended up scooping all the chicken off and piling it high with guac, sour cream and leaving the other mediocre toppings. With every bite I took, I thought about Qdoba’s wonderful tacos, their chips, queso, and free guac and sour cream. Qdoba, I promise I will never choose any other fast Mexican restaurant but you. And Daylight Donuts, you are still my favorite for doughnuts. 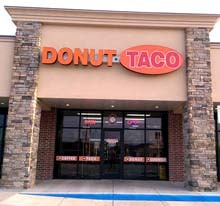 Donut Taco has OK doughnuts and bad tacos. Don’t waste your money.